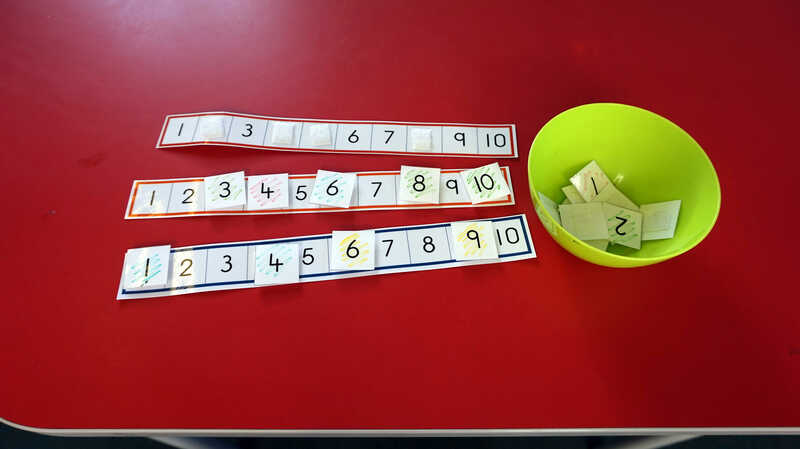 Find the missing numbers with this quick and fun maths activity. We have been learning how to order numbers to 10 and practising saying and writing them in the correct order. Children in my class have been enjoying playing this simple game at choosing times and at the maths table. All they have to do is find the missing numbers and velcro them in the correct place. Originally the idea was to fill in the answer with wipeable markers, but I found that the children weren’t great at wiping the pen off the laminated cards. This meant that the answers ended up being left on and the cards quickly became grubby and unattractive. This time I’m using sticky back velcro, hopefully this will be more successful. My only concern is that the game won’t last very long because the number strips will get crumpled as the numbers are pulled off. I was careful to use a clear font that was designed especially as a handwriting font with correct formation.